Several years ago I became aware of this specialty workshop that is all about photographing insects. It is run by three entomologists who are also fantastic photographers: John Abbott, Alex Wild and Piotr Naskrecki. Last year I went to Austin, TX for the workshop and learned several new approaches to insect photography, and especially learned about using flash in different ways to photograph small subjects, both in the field and in the studio. I even got to bring back a free, home made studio “white box” that provides even illumination for flash. The instructors are all extremely knowledgeable and approachable about insects and photography and will work with you to help you accomplish your goals. This year, with Bug Shot practically in my neighborhood (2 hours away) at the St. Jones Reserve near Dover, Delaware, it was too close not to go. The workshop includes dinner the first day, three meals Friday and Saturday, and breakfast and boxed lunch on Sunday. Participants ranged from young adults accompanied by parents to retirees, with many professional or academic entomologists in the enthusiastic group. Some folks stayed on site, but had to bring bedding; others stayed at nearby hotels. This year’s specialty was horseshoe crabs and the workshop was arranged to encompass the full moon and tides when the crabs come up on the beach. While horseshoe crabs are common in this area, Delaware Bay is a hotspot, to much of the country horseshoe crabs are a novelty. This is not typical and the usual focus is on terrestrial or aquatic insects. There were two night sessions and a day session at Ted Harvey Beach to shoot the crabs, but the beach area was available at any time. One of the more helpful aspects of the workshop is that interesting specimens are kept in the meeting room/studio in a temporary “zoo” for participants to practice their studio techniques on. The June bug, Bess Beetle and trogid (hide) beetle were made in the white box with two flashes. 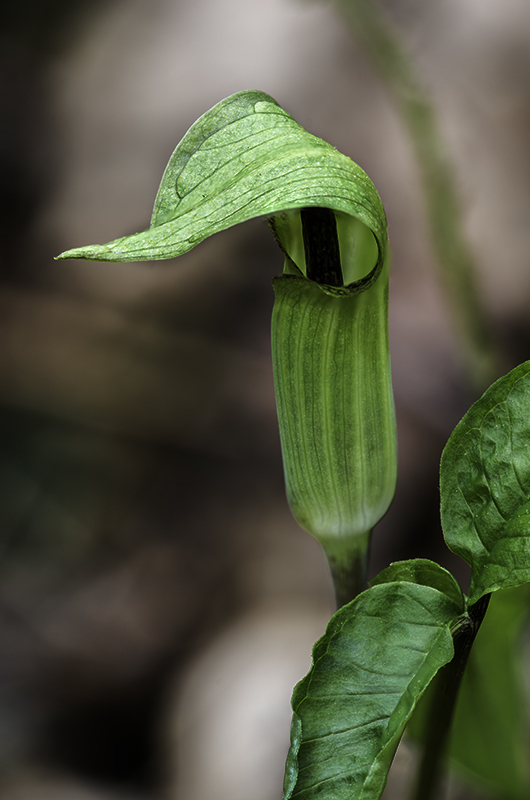 I am also increasingly using Piotr’s approach of getting close-up with a wide angle lens with extension tubes. The lighter lens is easy to hand hold and the depth of field allows me to keep the focus without needing a tripod, something that I can no longer do with a telephoto. The only negative about the workshop was the low abundance and diversity of insects at this time and location, for no apparent reason. Last year in Austin, there was tremendous diversity, including both male and female 6 inch long dobson flies. If you have any interest in nature macro photography or insects, I highly recommend this workshop. It travels across the country in successive years from west coast, to mid-country to the east. BugShot participants at Ted Harvey Beach ready for horseshoe crabs. Horseshoe crabs at night, Ted Harvey Beach, Dover, DE. 14 mm Rokinon, light painting with a flash light. Horseshoe Crab, Ted Harvey Beach, Dover, DE,. 14 mm Rokinon. Light painting with a flashlight. BugShot Delaware, St. Jones Preserve. 200 micro with 1.4X tele-extender. Bess beetle, St. Jones Reserve, Dover, DE. Hide Beetle, St. Jones Reserve, Dover, DE. – Minimize the size of your Photoshop working files without compromising editability Interesting comparison of PSD, PSB and TIF; helpful if you create large, multi-layered files. – Good tips for mobile photography With really excellent images to illustrate. – Long lenses for scenic photography Contrary to common knowledge, I usually use long lenses for scenic photography. If I have a wide scene I am more likely to create a panorama than use a wide angle. – New River Gorge National River, WV Another WV location to consider in the spring. – Undeveloped film from the WWII era – Film Rescue This was an interesting story. – A route to hit 47 National Parks Cool! – Interview with Jennifer King Jennifer spoke at the club last year. Two years ago I heard about Bug Shot workshops given by some entomologists who are also great photographers. I was too late to register the first year I heard about it and the second year was in California. I was hoping that this year it would have moved back east, but it was in Texas, further than I would have liked, but close enough to be feasible. I decided to drive and explore several wildlife refuges along the Gulf coast. We left on Sunday and the first two days were strictly travel. The fun began on day 3. In the morning we stopped at the Mississippi Sandhill Crane National Wildlife Refuge (N 30.45124; W 088.65537). Saw a couple of cranes by the side of the road outside the refuge but couldn’t safely stop. 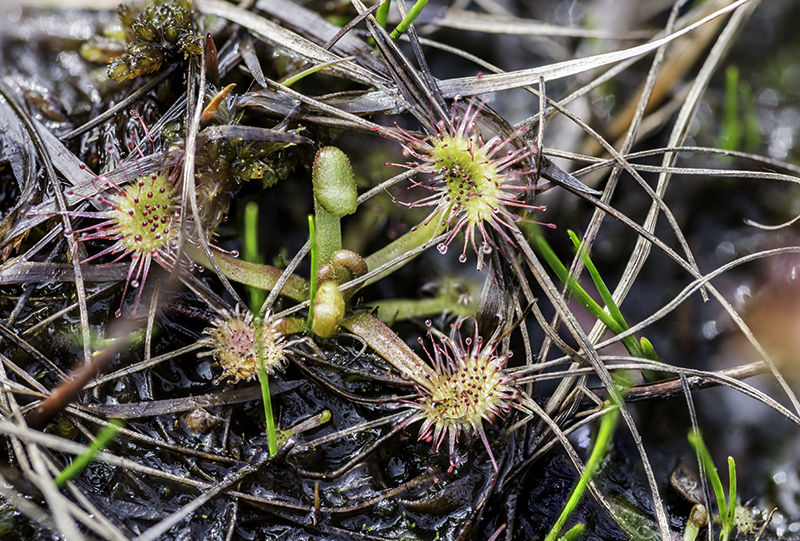 Although we couldn’t photograph cranes, we saw loads of great bog plants including yellow trumpet and parrot’s beak pitcher plants, and dwarf sundew. Also Orange Candy Root and Yellow Colicroot. The Refuge did a great job with little signs by various plants that were really helpful as was the volunteer manning the visitor center. We also stopped at Bayou Davis, the mainland part of the Gulf Islands National Seashore. Nice visitor center, saw an alligator, but the half mile nature trail didn’t produce anything but mosquito bites. Then onto New Orleans. Traffic and traffic patterns were so crazy we decided to bag going downtown. A local (we stayed in Gretna which was half the price of downtown) restaurant, Cafe 615 Home of Da Wabbit, recommended by the hotel served a a great shrimp etouffe with two fried fillets; service was excellent, kitchen was fast, servings were large and reasonably priced. The next morning off to Lake Charles. In the afternoon we went to Lacassine National Wildlife Refuge. The “Lacassine Pool” is the main attraction. Saw coots and ibis. Tried to go from Lacassine to Cameron Prairie NWR; got lost, but finally found the visitor center at about 3:45 to find that it closed at 3:00. Two miles down the road however was a wildlife drive and a very nice boardwalk loop through a marsh. Marsh was gorgeous, but it must have been wrong season or time of day for wildlife. Tomorrow will head west to Bastrop, TX southwest of Austin. Workshop starts at 6:00. Egret at Lacassine National Wildlife Refuge. With this blog I am starting an occasional series of locations in Maryland that I go to to make images. Loch Raven Reservoir is a drinking water source for Baltimore located north of the City in Baltimore County. You can canoe or kayak in the lake with a permit, but the craft can be used only on the lake to prevent introduction of invasive species like zebra mussels. David Simpson has a fantastic book on Loch Raven if you want to see what is possible from a small craft. There are hiking trails like this one from Backpacker magazine, or these from a hiker but I am getting older and tend to forego the more physical opportunities. It is less than 100 yards from where you can park your car on Loch Raven Drive (at least on weekdays) to walk down to the beach. Unless the weather has been especially dry, it is often somewhat muddy so be prepared. During weekends, the section of lake opposite the beach is closed to vehicular traffic but is open to pedestrians and non-motorized vehicles. You can park on weekends at Morgan Mill Road, about 0.4 miles away as described below. Heavy traffic heads south on Dulaney Valley Road in the mornings to access interstate highways and north in the afternoon as folks head home. Ducks and geese are common, with gulls frequenting a little island a few hundred yards out in the lake. The geese are relatively habituated to human contact and you can fairly close. Early morning light is at your back as you face the light, and the sun sets behind the island. The lake is not about awesome scenery, but more about quiet light and serenity. Take Dulaney Valley Rd turn north from Towson, MD. At the fork at the north end of the bridge stay right on Dulaney Valley Rd (don’t take Jarretsville Pike). At the next fork (Pearce’s Landing Restaurant) bear right on to Loch Raven Drive. Several miles further there will be an unmarked intersection on the left that is Morgan Mill Rd. You will also see a sign on the right saying that vehicles cannot pass, between 10 am and 5 pm on weekends and a yellow gate that is closed on weekends. On the left there is also a little roofed bulletin board with various notifications. On weekends, you can park on Morgan Mill Rd immediately on the left. On week days, you can continue another 0.4 miles and park on the road right opposite the beach. Just before the beach on the right you will see a sign on the right that says “NO” and lists prohibited activities. A composite image of the island described in the text with light on the trees in the surrounding watershed. It was the 53rd Wildflower Pilgrimage in Davis, WV, but our second trip. The Blackwater Inn in Davis was the host. This year my wife and I chose two different trips and spent part of Sunday at a third choice before coming home. This Nature conservancy location straddles the Maryland/West Virginia border. It is a relict community that is left over from the ice age because this West Virginia area is cold enough to maintain a boreal environment, at least so far, if climate change doesn’t make that impossible in the future. I had entered from the Maryland side previously and wasn’t aware that there was a boardwalk through the bog accessible only from the WV side, which is where went this time. This is one of the advantages of the Pilgrimage: people who really k now the area can show you the best places and help identify the flowers and birds. Because of the cold spring, some things that might normally be in bloom weren’t. I was able to get one very nice sundew. Others saw some water snakes playing in an open area. 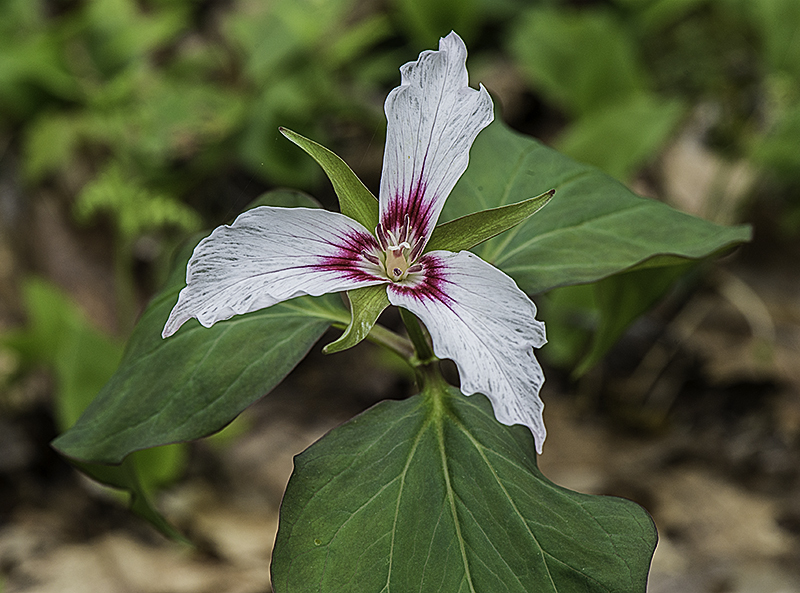 Numerous flowers along the trail. You can get travel directions from the Nature Conservancy website for Cranesville Swamp. The second half of the first day was spent at Cathedral State Park. I had been there before, but this trip was disappointing because it was rather dry and more open than usual due to storms that pulled down some old trees. This park has some really magnificent old hemlocks. It also has the biggest dandelions I have ever seen. Cathedral State Park is well-marked on most maps and you enter off of Route 50 in Aurora, WV. On Saturday we went to Otter Creek Wilderness. After a short trail hike there is a somewhat shaky bridge over Otter Creek. It is a replacement for a swinging bridge taken down at high water. A bit after the bridge there is some rough trail climbing over rocks with some muddy spots for about a quarter mile, but then the trail smooths out with some very nice wildflowers. 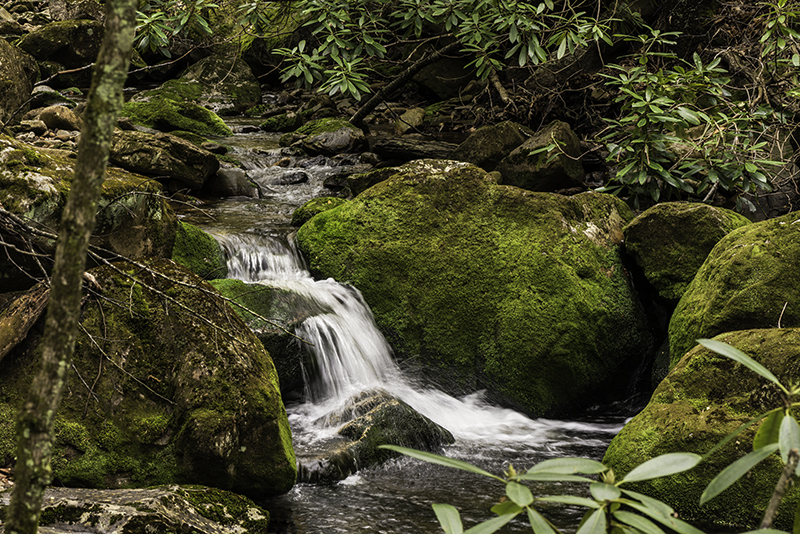 A small wadeable stream crosses the trail about 1 mile in with some very nice little cascades a short ways upstream. We were on our own on this one, and with another couple mistakenly drove up some pretty rough trails before turning around and getting some better directions. We stopped at only one location, near some maintenance buildings and a low water bridge. 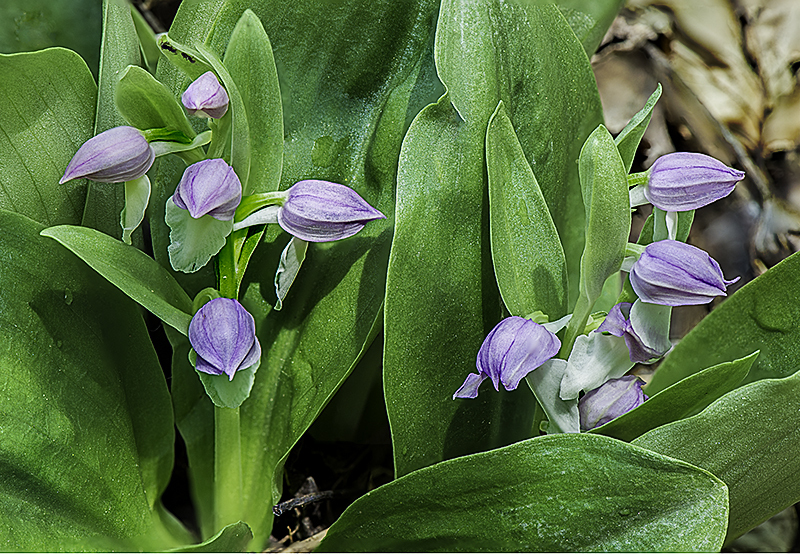 Around the bridge were gobs of Showy Orchis and other wildflowers. A really nice location.